It is just good governance for high-level decision-making city employees, with very high salaries and lucrative benefit packages, not to accept gifts, especially from the city's contractors, even when offered. The city of Elk Grove would be wise to adopt a similar policy as noted in this story. Several cities throughout California have correctly established ordinances addressing the acceptance of gifts by their employees. In Elk Grove, where no such regulations exist, it seems those employees who are the highest paid and have an out-sized influence on the choice of vendors, seemingly are the most prone to taking these dinners, golf outings and tickets to sporting events. Elk Grove city attorney Jonathan Hobbs is a prime example of this practice. Before being hired as a public employee in 2016, Hobbs was contracted as the city attorney through his former employer, Sacramento-based Kronick, Moskovitz, Tiedemann, and Girard, where he was a partner. Hobbs has continued to funnel business to his former employer while at the same time he is expanding staffing of attorneys at city hall by 25-percent. Of course, Hobbs, who is the second highest paid city employee drawing a salary of $250,000, not including benefits, continues to be wined and dined by Kronick, Moskovitz. Then there is the case of public works employee Brian J. Fragliao who enjoys playing rounds of golf. Next thing you know he'll be playing at Mira Largo with you-know-who. Let’s be reminded that the median salary for the Elk Grove resident paying these high salaries is $79,051 and the income-per-capita is $29,695, which includes all adults and children. Additionally, let's not forget a few years ago it was one citizen, Steve Lee, who came forward at public comment and subsequent reporting regarding the Elk Grove City Council's double dipping of mileage reimbursement to regional board and commission meetings when they receive a sweet per diem to cover such costs. More egregious, that double dipping also included billing the taxpayers for mileage to and from city hall from their home, not to mention luncheons while in their office at city hall. The Elk Grove City Council put a stop to double dipping as soon as it went public, adopting a new reimbursement policy. Will they follow suit here? Or better yet, will City Manager Laura Gill and/or Hobbs bring all of the of the high-level department heads together and "recommend" a new policy to the city council so that all city employees are viewed as being above reproach? After all, more often than not on any given agenda item, especially the complex ones, don't we hear at Elk Grove City Council meetings, "I agree with staff's recommendation." Let’s see what they do, if anything. Ms. Conley makes several excellent points. Perhaps the best is the summation when she asks "Let’s see what they do, if anything." I can't read if she is saying this a degree of sarcasm, which I suspect is the case. To answer the question, until they are pressured to do so by a mass of people, the staff will not recommend any change no matter how bad it looks because, hey, why? Who doesn't like scoring primo tickets to sporting events. The City Council will not do a thing because they lack the initiative, integrity, and more importantly, their delicate egos will not allow any change be initiated by the voice of citizens. Hey Capt. Willard! In this instance, I was not being sarcastic. 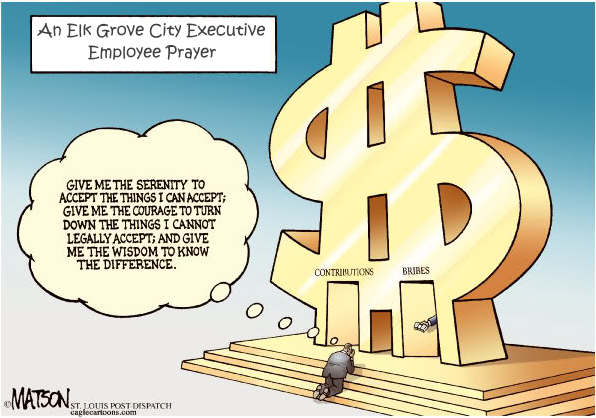 It would be a step in the right ethical direction, not to mention city staff would be following the city of Elk Grove adopted Code of Ethics - which includes staff - which actually states, "I avoid actions that might cause the public to question my independent judgment," not to accept gifts especially from contractors. Adopting similar language such as Buena Park's would be the right thing to do. "Employees are not to accept any gift or gratuity from an individual, company or organization doing business with the City because gifts can be viewed as unethical attempts to influence City operations. Although some offers are made in good faith and intent, all employees are expected to remain free from any potential conflict of interest. Any gift offered by an outside party should be politely, but firmly, declined."